Fall is officially here in Illinois with temperatures in the 50 degree range today. Brrrr! 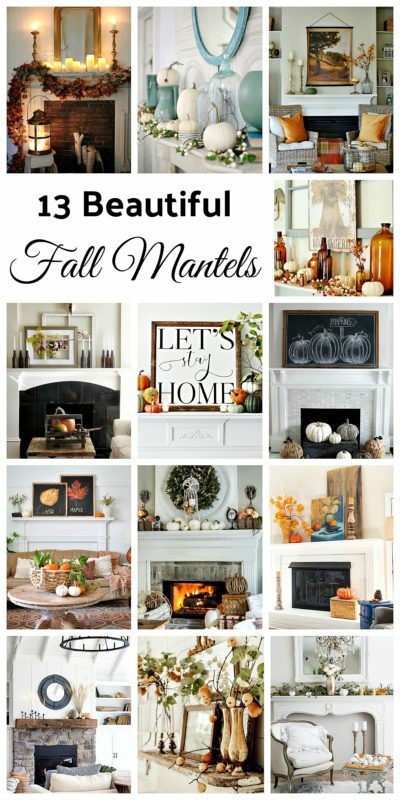 I need to feel warm and cozy so I’m sharing 13 fall mantel ideas with you today. I’ll start with one of my favorite mantels that I created a few years ago. 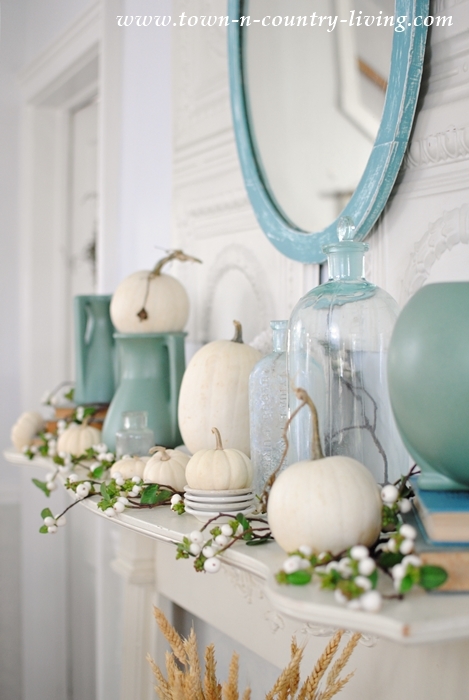 I used art deco pottery and baby boo pumpkins for this non-traditional fall mantel idea. 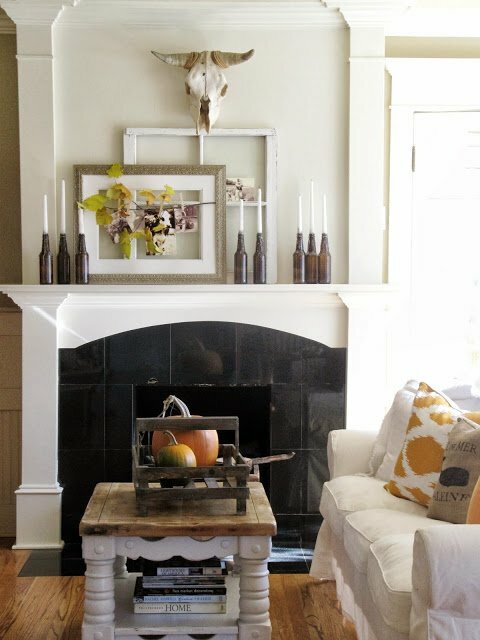 Natural elements and candles create a warm and cozy fall mantel by Courtney at French Country Cottage. Isn’t it beautiful? 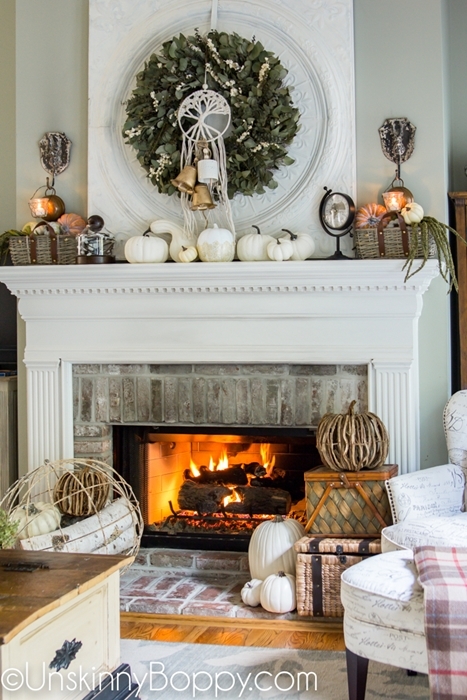 Cozy up to a warm fire and mantel at Beth’s fall home tour at Unskinny Boppy. 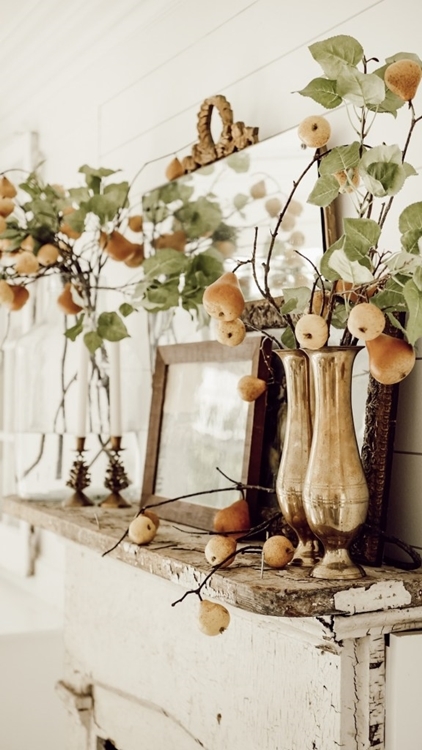 Liz Marie uses gorgeous pears and branches on her vintage farmhouse mantel. I wonder if she’d sell those gold vases to me. I love them. 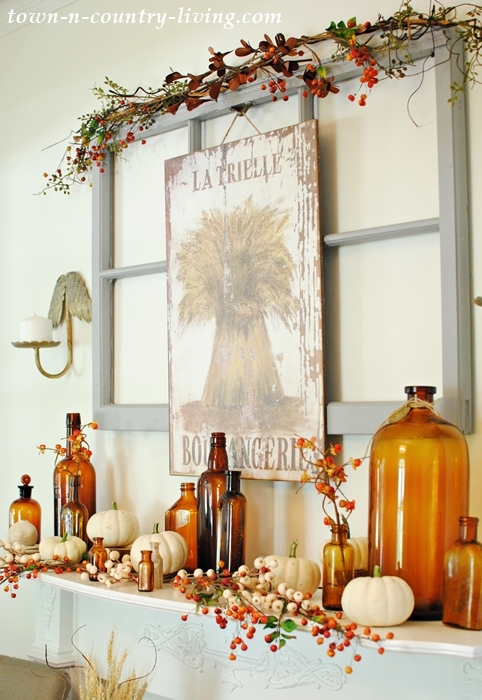 Pretty artwork creates an appealing fall mantel by Kellie at Nest of Posies. Jennifer Rizzo is one of the first bloggers I met (she lives fairly close by) and she’s an amazing artist. She painted the leaf art that resides on her pretty mantel in the living room. I heard she’s going to make more of the leaf artwork to sell in her shop. I think I need to get one. 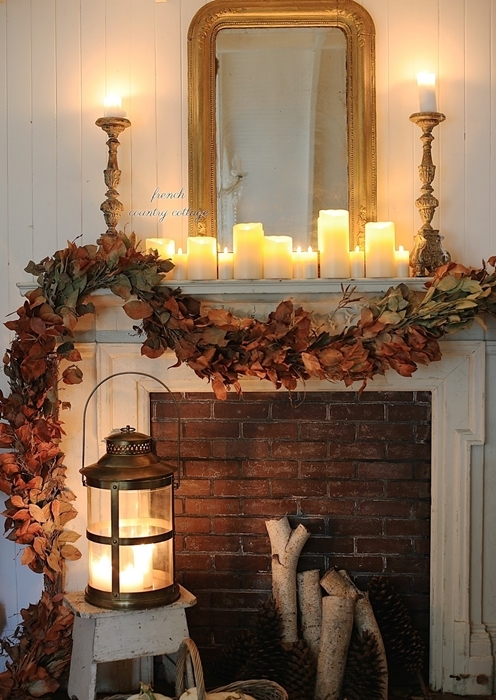 If anyone knows how to create a soft and elegant fall mantel, it’s Janet at Shabbyfufu. 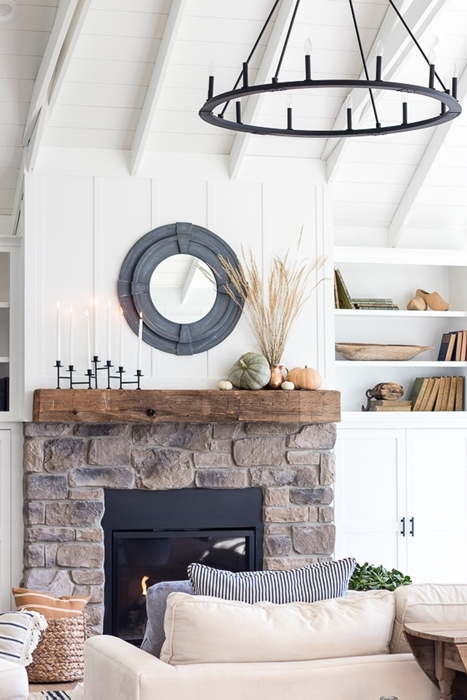 Kelly at The Lily Pad Cottage applies a minimalist touch to her modern country mantel. 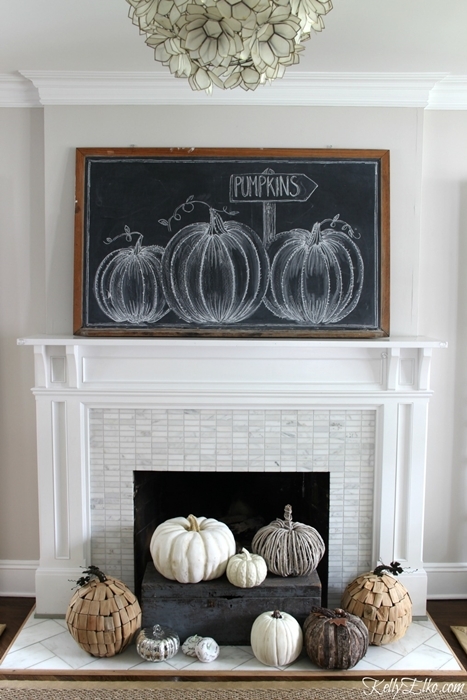 How cute is this chalkboard artwork with pretty pumpkins? 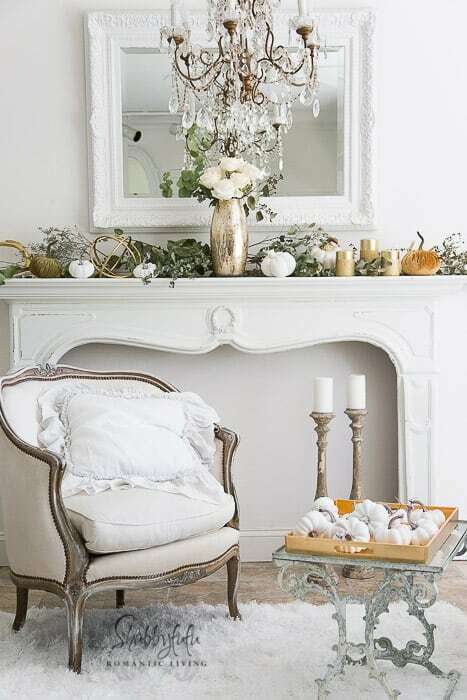 Kelly at Eclectically Vintage always has unique decor and her fall mantel is no exception. 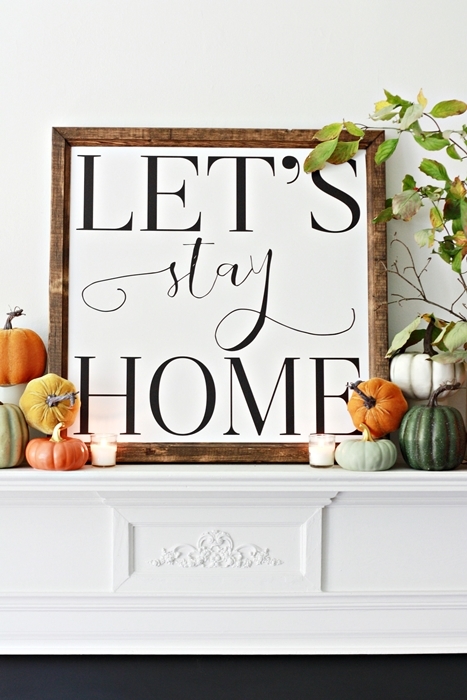 I’m swooning over this gorgeous autumn mantel by Vanessa from At the Picket Fence. I love her landscape poster – you might remember seeing my recent post about decorating with landscape paintings. 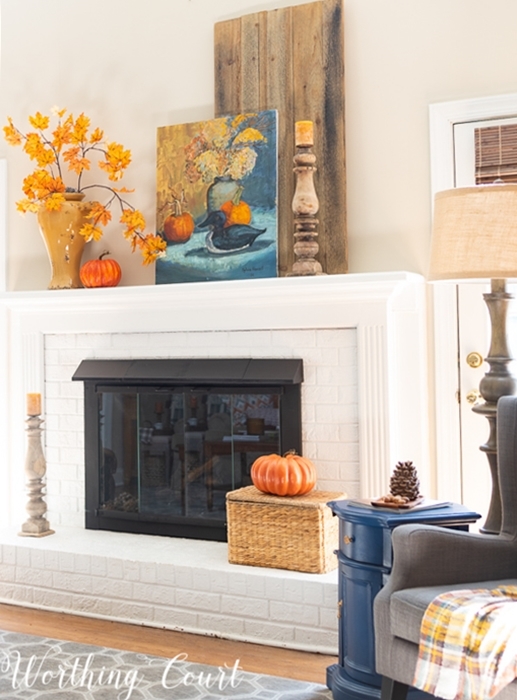 Suzy from Worthing Court shows her expertise with color when decorating her beautiful fall mantel. I love the color combination of orange-gold with the blue. She left the mantel simple so the color can really stand out. Beautiful! If you read my blog on a regular basis, you know how much I love bottles. So it’s no surprise I love this unique mantel by Emily of The Wicker House. Last but hopefully not least is my fall mantel from last year. I adore my brown vintage bottles! 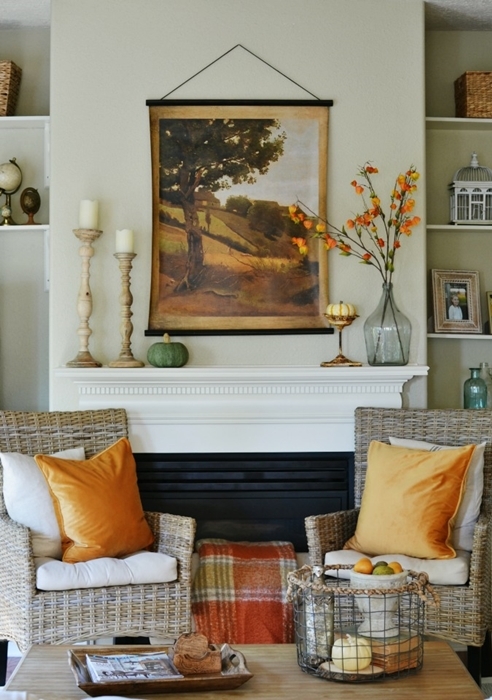 If you haven’t decorated your mantel for fall yet, I hope you found some inspiration from this collection of autumn mantels. I honestly never know how to decorate my mantle since it has a big window literally right behind and my mantle is quite wide. I always see these lovely mirrors and pictures/frames propped up behind and am envious since I can not do. It always looks so pretty. All these mantels were very pretty but I think I liked your first one the best. Love the little white boo pumpkins. What would i do if there weren’t some beautiful examples to look at for inspiration. Thank you.